Every once in a while, I need some creamy, cheesy pasta! This is one of my all-time favorite pasta recipes. It’s fast and easy, but still has this fantastic, indulgent flavor. The salty prosciutto and the fresh green asparagus are perfect additions to this grown-up Mac and Cheese. Serve this with some warm-from-the-oven Focaccia and a big green salad. Don’t forget to sprinkle a little extra Parmesan on top! What really sets this recipe apart is the Italian cheese, Gorgonzola Dolce, in the buttery, succulent sauce. It adds this delicious cheesiness and I can’t get enough! You can find Gorgonzola Dolce in the cheese department of Whole Foods and other high-quality grocery stores. You want to make sure it’s Dolce as you will often encounter Gorgonzola Naturale. Dolce is lighter and creamier than Naturale. The more assertive Naturale is also aged much longer than the Dolce. So double check for Dolce! 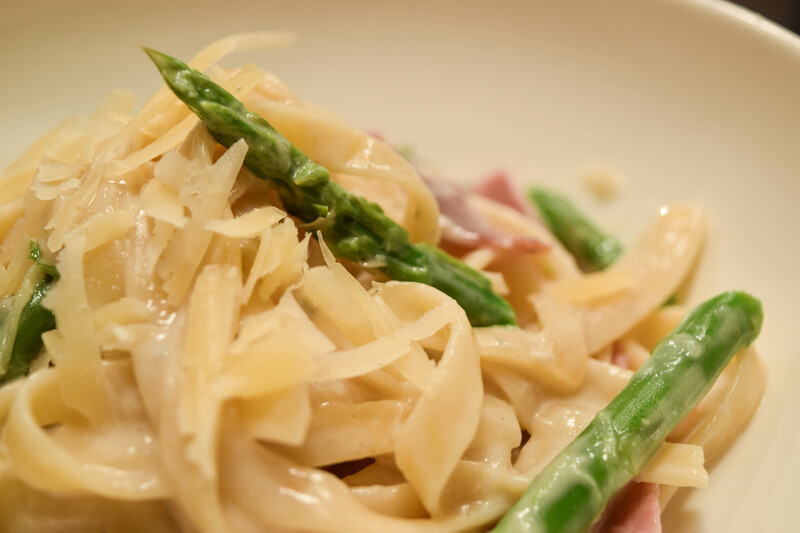 Tip: If you want to cut down on cook time, substitute two cups of thawed frozen peas for the two cups of Asparagus. I love the crunch of the Asparagus, but I have made it with peas and it’s pretty delicious as well. Fill a medium pot with water and bring to boil. Boil the chopped asparagus for three to four minutes. Remove from boiling water and pop into a bowl of ice water. Set aside. Fill a large pot with water and bring to boil. Add one teaspoon of salt. Melt two tablespoons of butter in a large (12 inch) sauté pan over medium heat. Add the prosciutto and cook for five minutes until crisp – make sure to separate the pieces with tongs. Remove to a plate and set aside. Add the remaining tablespoon of butter and sauté the onion, about seven minutes, until tender. Add the garlic and cook for one minute. Add the cream, Gorgonzola, pepper, 1 and 1/2 teaspoons of salt and bring to a boil. Lower the heat and simmer for five minutes, until thickened. Turn off heat. When the sauce is halfway done, add the pasta to the boiling water and cook until al dente. Reserve two cups of pasta water and drain off the rest. Pour the pasta into the pan with the sauce. Add the drained asparagus, prosciutto, basil, and 1/2 cup parmesan and mix well. Taste for seasonings. If the pasta seems too sticky or thick, add some pasta water to thin out the sauce, a little at a time, to reach the prefect texture. Enjoy!! 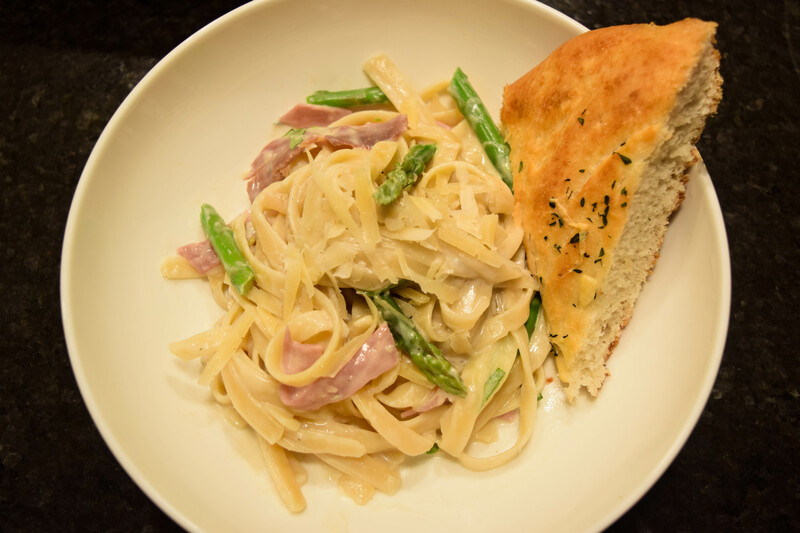 Tags: asparagus pasta, cheese pasta, creamy pasta, Creamy Pasta with Asparagus and Prosciutto, gorgonzola pasta, pasta. Bookmark the permalink.